New York was pretty hot and muggy, and my boyfriend and I had a normal sized Smeg refrigerator in our hotel room, so we took advantage of that and walked over to H-Mart to take the edge off with some frozen treats. 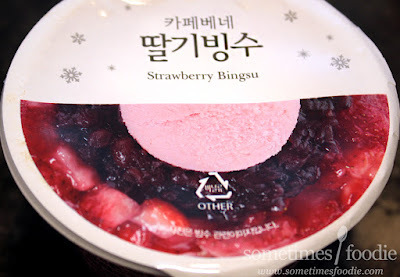 He opted for a box of Melona honey dew bars, and I grabbed this Dalki version of Strawberry Bingsu. I tried Bingsu for the first time about a year ago. 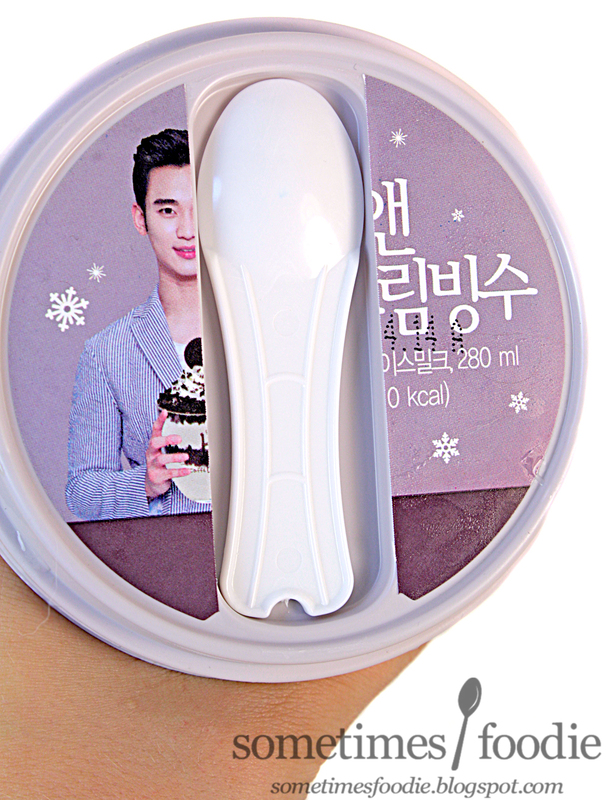 There was a cookies and cream version at my local H-mart featuring K-drama actor, Kim Soo-hyun that I just couldn't resist. 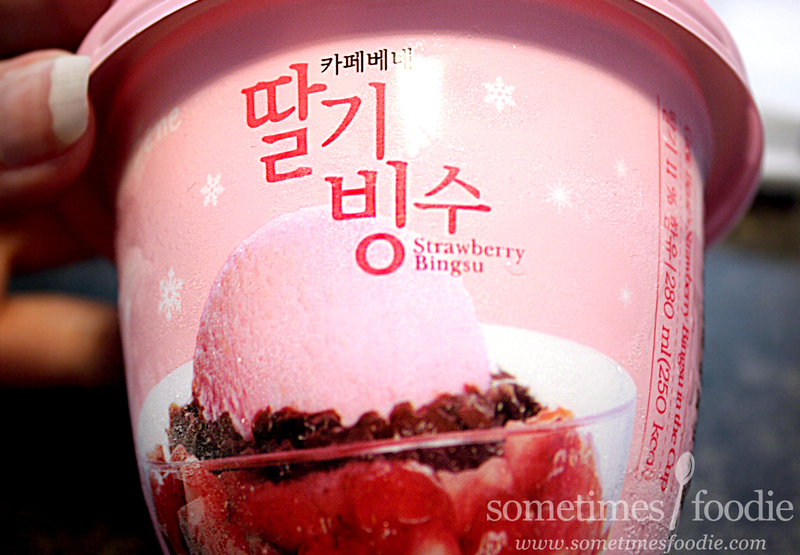 My H-Mart offered two other flavors, a coffee version and a green tea one, but never strawberry. I felt like I owed it to myself to check this flavor out, plus this package features Dalki! She's kind of like the Korean version of Strawberry Short Cake! These photos aren't as professional and polished as I would have liked, but I was in my NY hotel room at night with limited lighting options. They're not bad, but they don't do the cuteness of the packaging justice. 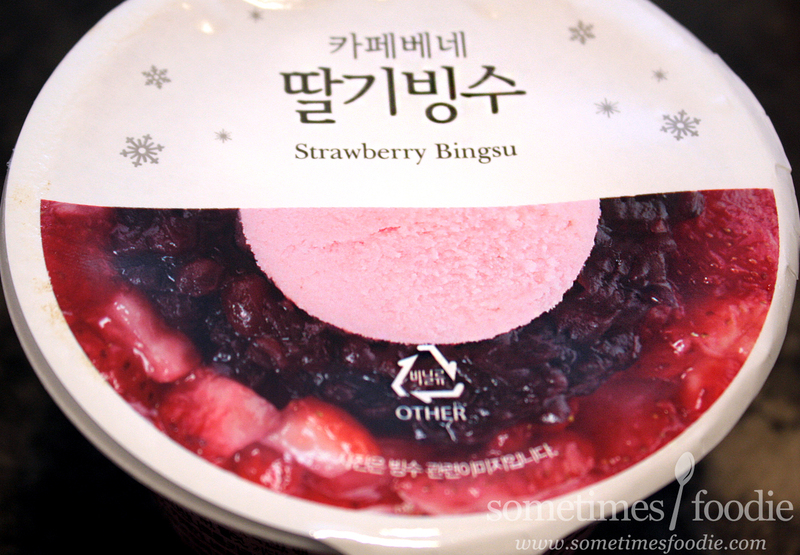 The packaging consists of a pink colored lightweight plastic tub with a slightly ovate shape towards the bottom, a plastic lid, and a hidden plastic spoon. If you peel the center panel of the Dalki sticker up, which kind of rips her face off, there is a little white spoon hiding underneath making this a really convenient hotel treat. Not only is the packaging really functional, but it's pretty darn appealing too! We've got lovely creamy pink pastel colors, a fun illustration, and lovely food photography. The English translated text looks default and takes away from this product's polished look, but overall, very nicely done. I only wish I had a travel photo set-up to do this container justice. Trust me, it's even cuter in person. Not exactly an accurate portrayal of the contents inside. It looks like vanilla soft serve ice cream and frozen strawberry topping to me, not at all like the strawberry ice cream the packaging promised, and there's no ice or red bean in sight. Armed with my little plastic spoon, I started an archeological dig to find the rest of the promised mix-ins. The ice cream portion and strawberry topping were pretty tasty, but about on-par with a fast food sundae, nothing too special there. Although I was a little disappointed that it wasn't strawberry flavored ice cream. 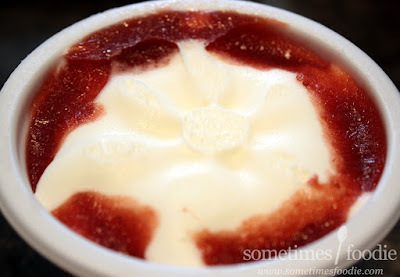 Thankfully I didn't have to dig too far before I hit a channel of ice-y red bean "snow" which made this dessert a lot more refreshing and unique than your standard strawberry sundae cup. Alone, the ingredients are enjoyable, but nothing all that interesting It's when you mash everything together and get that perfect ice cream, red bean, ice, and strawberry puree ratio that this dessert really shines. The crushed ice makes this feel really light and refreshing since it breaks up the creaminess of this dessert, which was perfect after walking the muggy streets of New York, and it's almost like eating a gelati (ice cream and water ice mix). 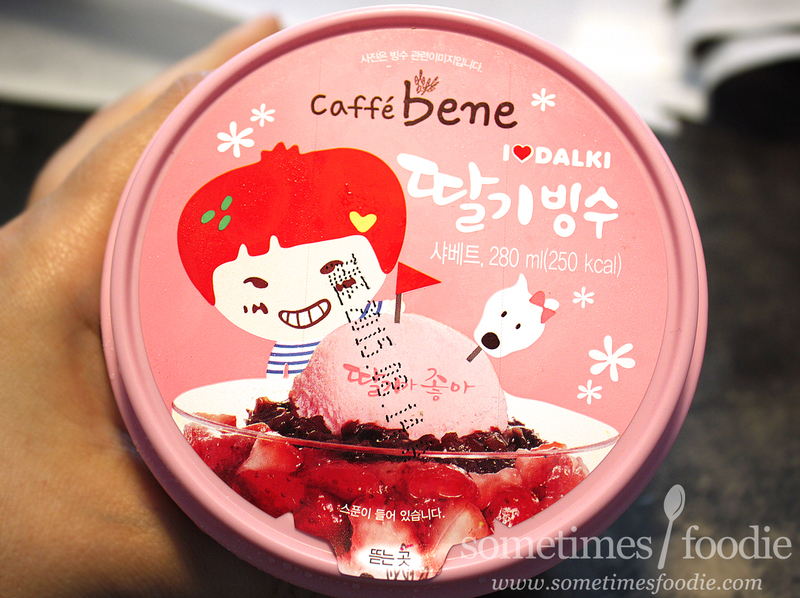 It was a really refreshing flavor of Bingsu, perfect for summer, but the best part about this dessert is that it taught me more about Dalki. Before this I had never heard of her, but she's really stinking cute and she has her own theme park in Korea? At first I thought she was going to be a food themed Sanrio-like character. She's a cute strawberry-themed little girl, which makes sense since "Dalki" means Strawberry, and she lives in a fruit patch with her food themed friends and watermelon themed boyfriend! 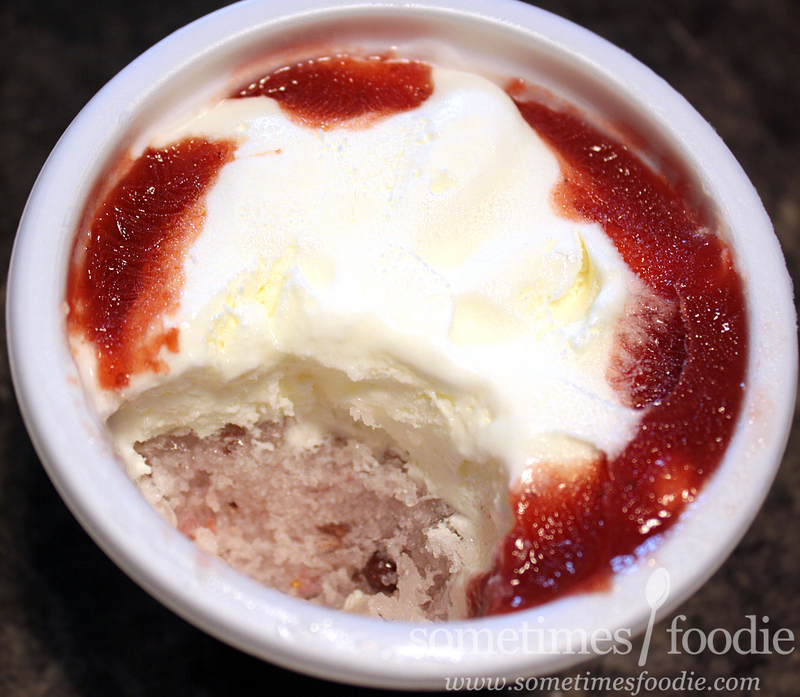 Sounds very similar to Strawberry Shortcake to me! The description goes on, and you can read it here, but I'll just...I'll leave it at that.So she's a very cute character used to sell accessories with her own theme park in Korea, but there's a bit more to her than meets the eye.